So this is usually how walks go. The beginning is always like this. As the walk goes on she is more calm but still pretty much the same. How can I make this better? Am I doing something wrong? I'm not sure what you mean by "make it better". So, that being said, my walks start out very much like yours (except I have a long leash - about 10 ft, I am constantly "minding my lines" keeping it coiled and letting it out as Ami meanders.) Look at it from the Bandit's point of view - she has been contained inside for a good part of the day - now she gets out, she gets to see the world. I say, let her explore - if she wants to stop and study a scent - let her. You can watch her, enjoy her focus, her excitement. If she wants to trot right along, than speed up (to the extent that you can). If she wants to dig a hole...well, you're in suburbia, that probably is not appropriate I say, let her "be a dog." She certainly does not seem to be pulling, terribly (do you have an anti-pull harness of some sort?) I don't really see a problem here...unless you have limited time and you are trying to get max mileage in minimum time. Them - you could teach "on by" to continue when distracted (but, really, you are already doing that with "come on" which she appears to respect quite well. Then we'll let Jeff disagree with both of us. I'll take Sasha out on a 30 foot lead and let her wander 'cause as Amy says the walk is really for the dog after being cooped up all day. That said, however, I can bring Sasha in so that she's walking beside me and she's okay with that (unless something jumps in the brush). On the way out I let her lead with some general guidance as to direction; on the way back we bring the lead down to "heel" position so that she's walking nicely under my guidance. What I'd start doing, if I were in your shoes, is bringing her back into a "heel" position as you're on your way back from wherever so that you can bring her to heel when you need to - like when that car was turning around right in front of you. Hope that helps. Good luck! I know how fun (and sometimes not so fun) it is! Haha, you two should know better than to call me out ...... You're both right, I disagree. But, as always with agreement or belief, the relevance of that is a function of need and personal standards. She's not pulling you down the sidewalk, which is great. Count your blessings. And she isn't in heel position, which isn't really a big deal if that's not your thing and you don't have a need to be concerned for the mental side effects of not heeling. That said, I see how dogs walk on leash not as a dog lover or an emotional person, but as a balanced dog trainer. I tend to focus more on the dog's state of mind than on the dog's position at any given time. There are any number of things that are indicative of certain states of mind, and there are a few key examples of states of mind that tend to be the foundation upon which the majority of bad behavior and disobedience are built. Namely, these are anxiety, impulsiveness, and prey mode. There is no question that Bandit is showing all three in the video. Knowing what we all know about Tony and Bandit I would say that this is reason to be concerned. But again, this is just with my dog trainer cap on. If Tony were a client and I saw this video, I would not allow this type of walking to continue a day longer. This is exactly the type of walking that allows and triggers dogs to chase animals, bark at dogs, get into dog fights, jump on humans, bark at humans, or any number of other things that people pay lots of money to get dog trainers to fix. None of these things may be happening yet, but it is walking this way that allows them and triggers them. If a dog is properly heeling and in the correct, corresponding state of mind none of these things will happen. Ever. So the dog trainer in me sees it that way. I get the "let the dog be a dog" thing, but the problem is that this leads to people being miserable with their dogs. Dogs are not wild animals and we shouldn't allow them to be one, especially if we are walking around with them on a daily basis in a city. Country folks with country dogs? No problem whatsoever. Not heeling is not a problem because again there is no relevance or need. I just see a ton of impulse and free reign and agitation in the video and these are what make people struggle to live with their dog. Just my take. I don't think all dogs should heel, but I do think that all dogs in cities owned by people who struggle continually with their dog should invest in their dog knowing how to heel. Great advice Kevin for exercising and physical release. So there's that, too. 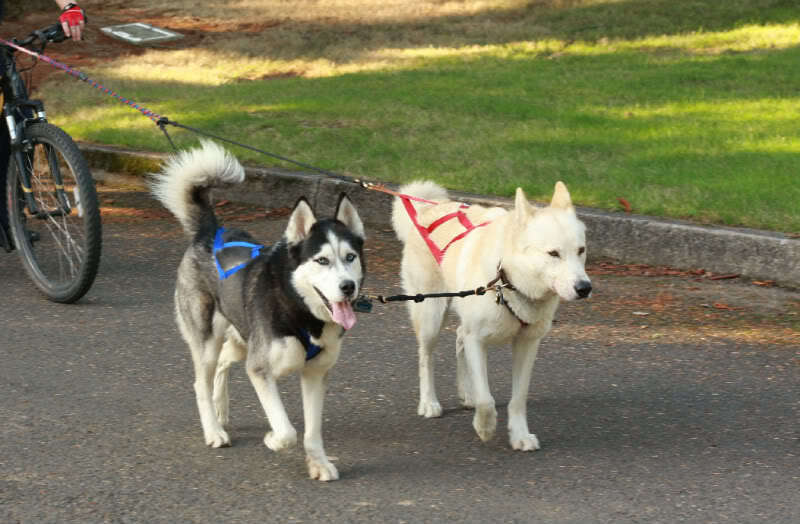 Running and pulling are physical exercises and can be very emotionally fulfilling for a Husky. 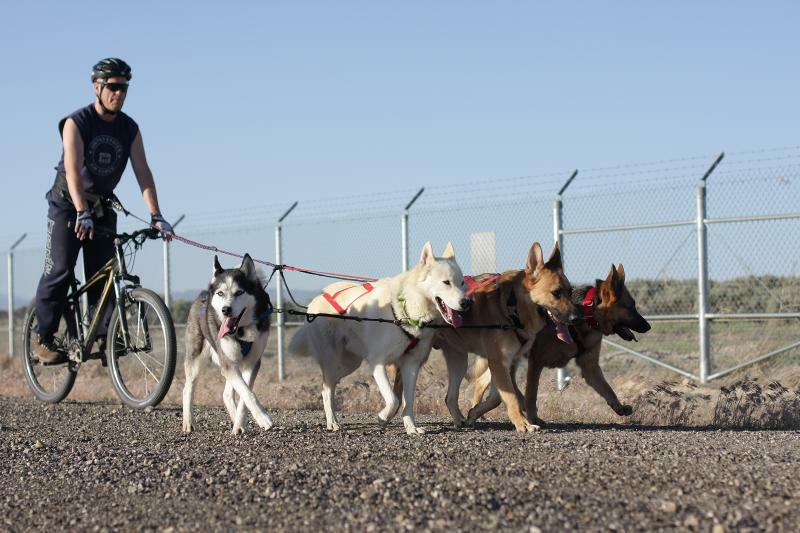 Heeling is mental exercise and relationship building that forms an emotional connection between dog and handler. I teach my dogs when to heel and when to EXPLORE. I use EXPLORE as a command to let them know that I'm giving them the full 6' of leash to roam, sniff, mark, whatever. But when I want them back in a heel position, I tell them HEEL and reel them in. I usually let them explore in grassy areas with trees and lots of smells from people, dogs, wildlife, etc. If we are on a sidewalk or street, they need to heel and be under control at all times, especially when there are other people (and their dogs) walking in the near vicinity. I just no longer enjoyed 3+ hour (many, many miles) brisk walks that didn't seem to make a dent in their energy level, and as soon as we would get home, it was like we didn't even go for a walk. They were ready to go again and again. That's why I switched to bikejoring. 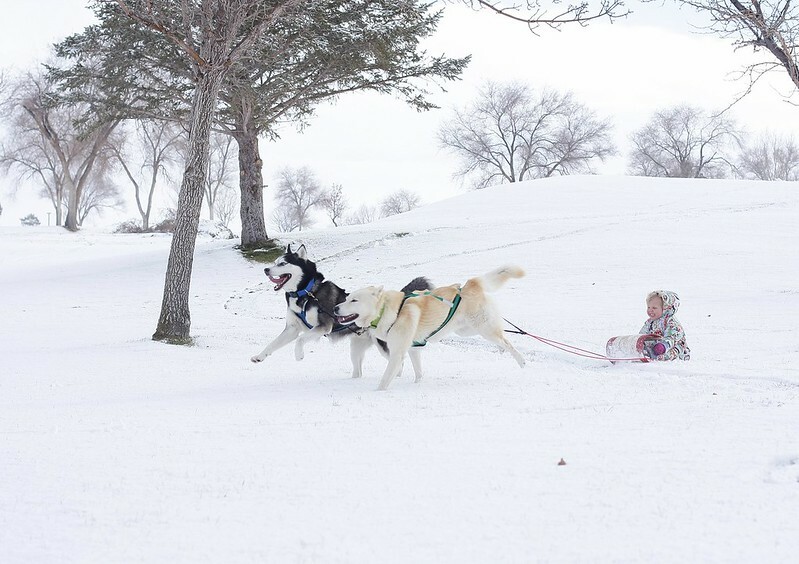 I've also looked into carting and dog scootering, as well as dog sledding (of course!). Bikejoring was the most practical at the time, as I already owned a mountain bike. Now we can do more mileage in less time (45 minutes, instead of 3 hours) and the dogs expend the majority of their energy. We've gone 14 miles at once, which is our personal best to date. 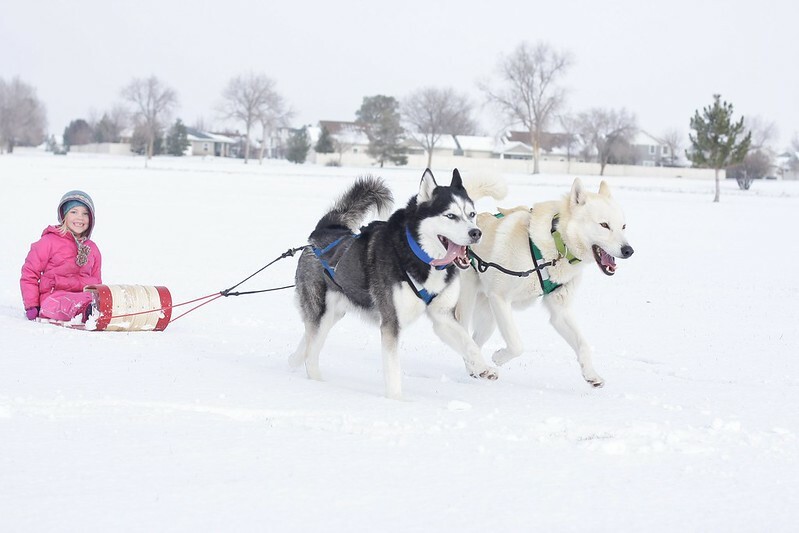 It's so much fun to get that sled dog experience when there isn't any snow to sled on. 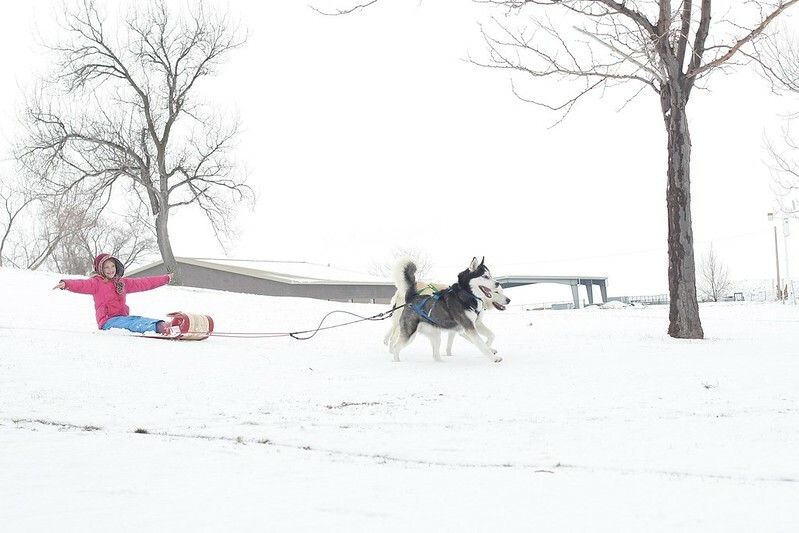 They call it urban mushing and dog powered sports. I highly recommend it! We started this when we lived in Portland, OR, within the city limits. We just had to find a secluded place where we could go longer distances without a lot of distractions. Again, good luck! Hope we can all help you. All great advice. I think I need to start with her listening while outside. She doesn't listen while outside. Very rarely does she. Same commands inside BOOM she responds instantly. Obviously cause there are way too many distractions outside. Even if it's just us in the backyard throwing a ball or frisbee she has a hard time paying attention. Any ideas? I don't think all dogs should heel, but I do think that all dogs in cities owned by people who struggle continually with their dog should invest in their dog knowing how to heel. Jeff, I couldn't agree more - you know I always have a story, right? When I was in Japan, I acquired a very large GSD - he'd been passed from GI to GI as we rotated out. Even given that, he was an excellent dog. I *could* walk him down the busiest street in Chitose and he'd be right by my side, leash or no (had to have a leash, he scared the blazes out of the Japanese!) I could go into the forest / lake region with this dog and he'd run like there was no tomorrow. Different places, different situation, different control. The fact that she alerts at various times, to me, just indicates an intelligent interest. Had she even tried to move toward whatever it was, then I'd be more in agreement with your perception that "Namely, these are anxiety, impulsiveness, and prey mode. ... There is no question that Bandit is showing all three in the video." And finally, ah, yes, we are talking about Tony and Bandit (and not meaning any offense, Tony can worry about the least thing). It is an obvious concern, I think to all of us, that Tony needs to be more consistent in working with Bandit ... the relaxed stroll he taped can be an enjoyable excursion but he also needs to be able to have Bandit under tight reign such as when the car was approaching then in the video, that did make me nervous. "Heel" particularly at that point in the vid would have been quite appropriate. Kevin, your "explore" command is quite similar to what I do with Sasha, I may reel her in to a heel position (and tell her to heel) but I also will tell her "free" and drop the extra lead. The dogs do need to know the difference and that there are times when what we want (for their safety) overrides their desire to explore. I make Okami heel when we are by a road, or on paved/ or dirt trails. When we are in fields or large nature areas, I do the "let the dog be a dog" thing and I let up on the leash. I have done this so much, that she has learned the differences in the terrain, that she doesn't need much correcting on heeling anymore. When I want her to heel, I say "Stay with me." When she can roam free with much slack on the leash, I just give her the slack and she knows. Everytime your dog pulls, stop. Dead in your tracks. Wait for a sit reaction, or at least make sure you have your dog's full attention. Then begin walking again. I would also give my stay with me command the second we start walking again. My release command is just Okay, which means Explore out of heel. The typical ratio of heeling : exploring for us is 90 : 10 on any given walk. But that 10 is only on release. No sniffing or peeing or meandering or socializing without release. Lucy that is the basic teaching heel technique taught by Positive only trainers, basically ignore or block the bad and reward the good. I guess we're really lucky out here...I rarely have to use heel. The lucky part is... when I do need it... Ami is quite responsive. I'm not sure how we achieved that (maybe in the Boston area last spring - at my son's for 2 weeks, I had to walk Ami on busy road without sidewalks And poorly lit ) when it is safe and appropriate, I just a say "ok" for release. Anyway, I do believe heel has its place... as does free walking. Especially for a dog that is contained for large parts of the day. Funny... now that I think back, when we first looked at Ami, I took him for a walk and used teaching him to heel as a test as to how responsive he would be to training and whether or not I could manage him. He passed with flying colors! Once again, I think we're all saying pretty much the same thing - differently. Bandit needs to be taught to walk at heel - I don't think anyone will argue that. Her safety (and Tony's) can depend on her being taught how to behave "politely" when out in public. How much free time to roam would seem to be the discussion point; since we live in very varied locations - metropolitan to extremely rural - we each have different ideas on how much freedom to give our dogs. I think that Jeff's responsibilities as a trainer impact his desire to have a well behaved animal and would be surprised if that wasn't his desire - but not all of us are trainers and need / want that amount of control. Well said Al, fully agreed. I want to work on listening while outside and leash control.